Whether you’re a frequent flyer who regularly travels for business, or if you just fly once a year for your family vacation, you know that flying can be one of the most stressful and tiring experiences of your journey. When flying economy, you have little leg room, odd next door neighbors, super long queues and pretty basic commodities – Yep, the toilet will always smell! But there is another part of the plane that you barely ever see: First Class. Unless you’re really lucky, of course. Here’s what it’s like to fly in first class. We’ve all seen the scenes in movies where the two unsuspecting victims meet next to each other on the plane, share a pleasant hello and then a cliche moment brings them together – cut to the ending and they’ve become BFF’s and set up a meeting in New York to go over a business proposal together next month. Okay, it doesn’t really work like that, but many people do use first class to network with other like-minded. Because the people who fly in First Class normally have more money and work for Fortune 500 companies, they’ll all have something in common – business. In fact, Virgin Atlantic have found that one in five of their First Class customers had done business with someone they had met during their first class flight. Some airlines are now even creating specific networking flights! If you’re used to flying economy, you’ve probably seen the First Class passengers stroll along past you with their fast-track boarding passes and saunter onto the airplane while you crouch on the floor in a crowded airport lounge. Yep, the first class passengers not only get to board the plane first – but they also get to depart the plane before everyone else too! This means they can get ahead of the game, and be the first in the queue for customs and baggage reclaim. Ultimately, this means they get even more vacation time because they’ll be out the airport doors and onto the beach while you’re still stuck on the plane! Okay, we all know the deal. Economy flights are in NO WAY comfortable. With little-to-no legroom, a next door neighbor who is sitting way too close to you and using your armrest, and absolutely no way to stretch out and have a good kip; a long-haul flight can be an absolute killer. But long-haul First Class flights? They’re a completely different story. In nearly every first class area of any airplane, the seats are a world apart. Quite literally. With individual seating, each passenger gets their own little area of the plane with a reclining chair (which makes an extremely comfortable bed), a sliding divider which shuts you off from the other passengers, and your own personal TV. The nine-hour flight will just be like your average evening at home. If you’re traveling on a business trip and need to perfect your presentation before you reach your destination, it will be pretty impossible to do so if you sit in economy – because you two choices; have the ability to feel your legs and not get work done, or get work done and lose all circulation. The choice is yours. However, in first class, working is no issue. In fact, your plane journey will probably be more comfortable than your own office! In your First Class seat, you’ve got your own individual table with ample writing space, multiple power sockets to ensure your laptop never runs out of battery, and most now have WIFI! Who needs an office? You don’t need to be rich to fly first class! 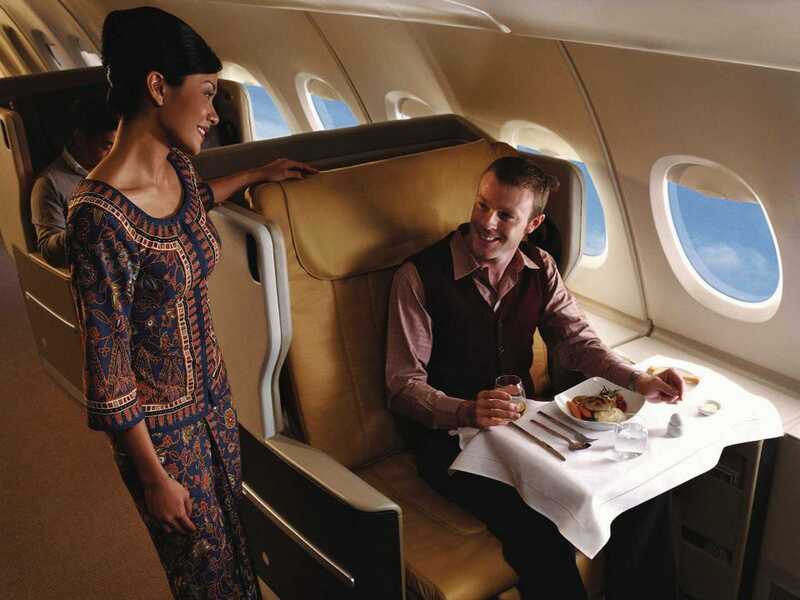 There’s a common misconception that you need to be super rich to afford seats in First Class. As much as it is true buying first class seats through the airline will cost you a hefty sum, there are ways to try and get a first class upgrade for a cheaper price (or even for free!). First and foremost, you need to go by the premise that ‘it doesn’t hurt to ask.’ You’ll be surprised how accommodating airlines can be when it comes to upgrading their passengers – if you just ask! The best way to do this is to always be polite and friendly to them when you go to the check-in desks, and if they have something available, they may bump you up. If you don’t ask, you don’t get! Ever wondered what it’s like to fly first class? Here are a few pointers to whet your appetite, but why not try it out for yourself?